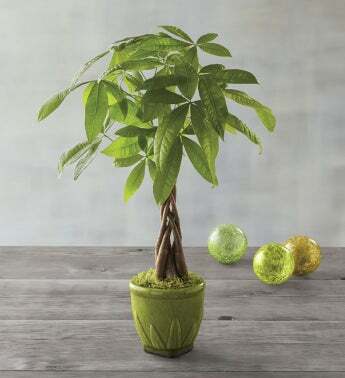 The Money Tree or Pachira is thought to bring good fortune. Certainly it will bring delight with its lush leaves and expertly trained and braided trunk. The Pachira is very hardy. It prefers low light and infrequent watering and should be kept out of direct sun. It is planted in a 4-inch green leaf ceramic pot. With minimal care, your Money Tree will thrive, offering years of pleasure and perhaps a bit of luck.